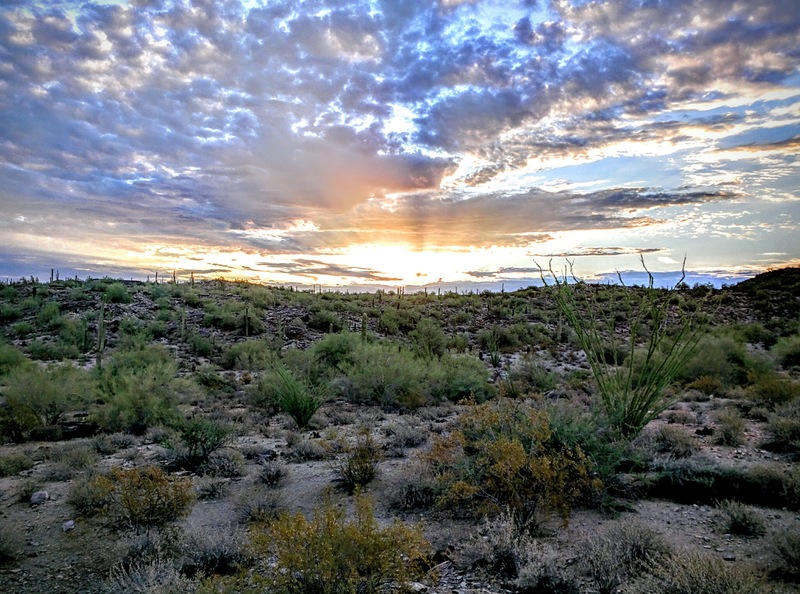 Phoenix is an amazing place to live. Just within the city itself, excluding all the surrounding cities and mountains, there are more than 180 miles of unpaved trails, countless ponds stocked with fish, and a canal system that offers biking unimpeded by traffic. 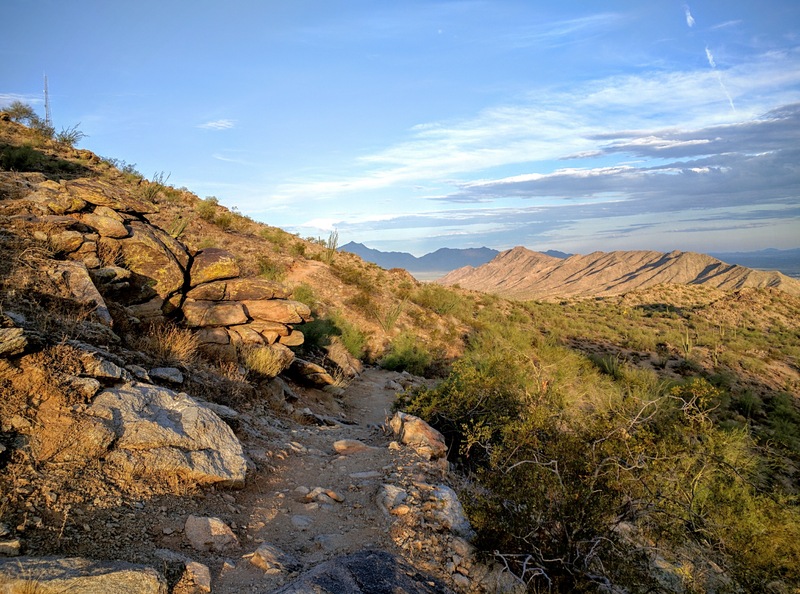 If you include the entire greater metro area and the mountains that are in direct contact with it, the trail mileage increases into the thousands and you have access to two rivers and 5 large lakes. 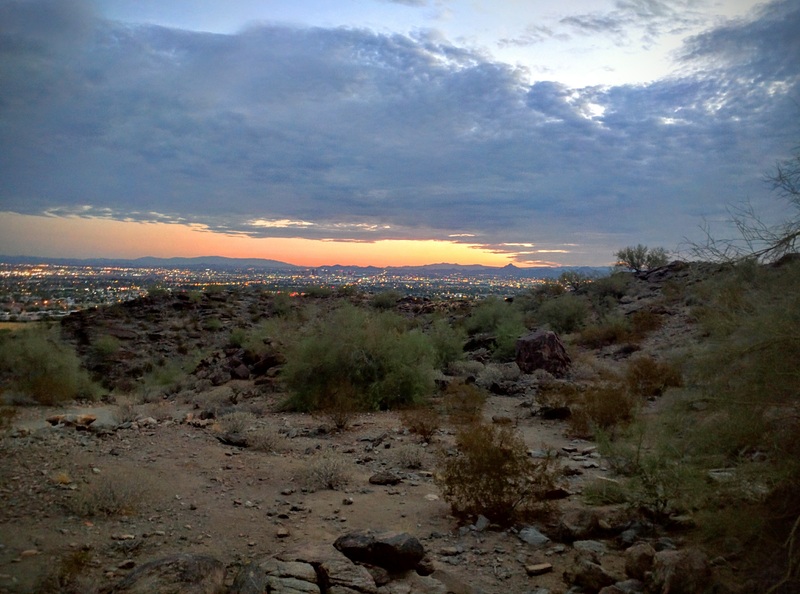 All this made me go as far as to (controversially and with complete bias) name Phoenix the greatest place to live if you love the outdoors. 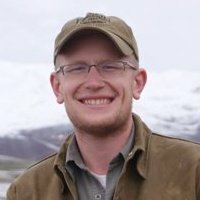 Then I wrote two hiking guides (one for spring and one for summer) that focused on far away places and were suspiciously were missing any of these great trails. 1.) Rather than writing one big guide I have decided to do this new series over time– we are going to cover the hikes as I do them. 2.) I’m probably just going to use my cell-phone for the pictures. These hikes are my way of getting more stuff to you faster, and this will cut out much of my photo editing time. Don’t worry though, you will still get all the same meticulously crafted photography on our usual posts. Plus, this means we will have lots to put up on our instagram! 3.) Most of these hikes are going to be moderate or hard. These hikes are how I stay in shape! I promise I will try to throw in an easy one occasionally. But first a warning: THERE IS A REASON I DIDN’T NAME ANY OF THESE HIKES IN MY SUMMER HIKING GUIDE. That is because it is summer, which means the sun is currently trying to melt every living thing in the greater Phoenix Area. Hike early in the morning or late at night and carry plenty of water. 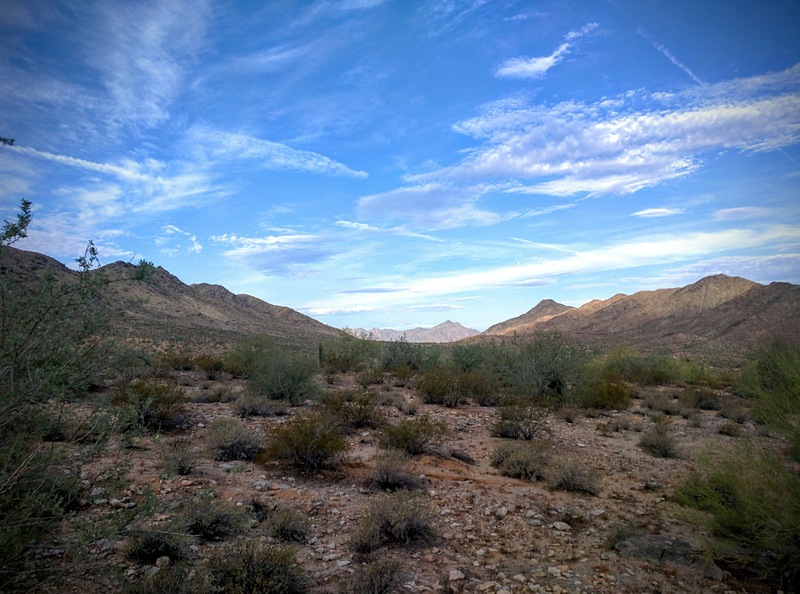 Trailheads that are gated generally open at 5AM and close at 7PM in the summer. Also, be aware that every creepy crawly in the world also wants to avoid the sun, so keep an eye out for snakes, spiders, and of course chupacabra. Basically, don’t be dumb. Its not my fault if you get hurt. ON TO TODAYS HIKE, a classic, The Holbert Loop. 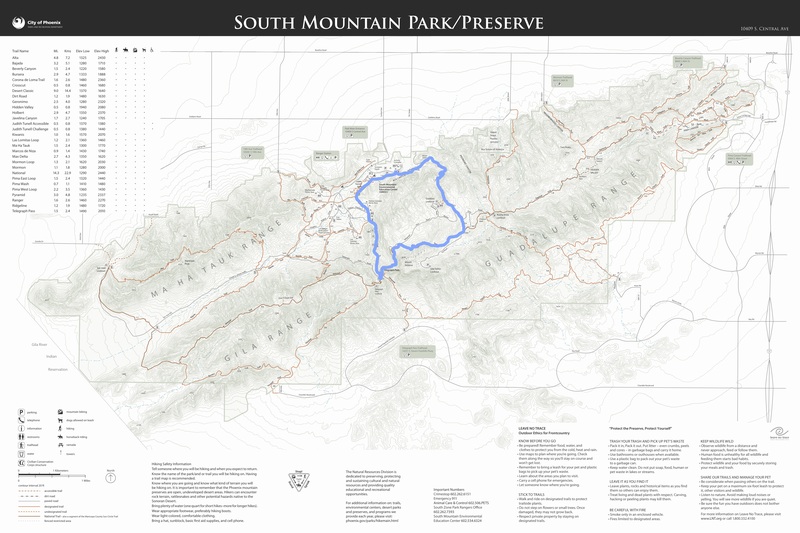 South Mountain Park is the largest city park in the world. Covering more than 25 sq miles, the park is large enough that seeing the entire range in one day is almost impossible without setting up a car shuttle. For us though, this is good news: The park’s girth makes it eminently possible to feel like you are “out there” while stopping for a quick hike on your way to work. This flatness doesn’t last long though. 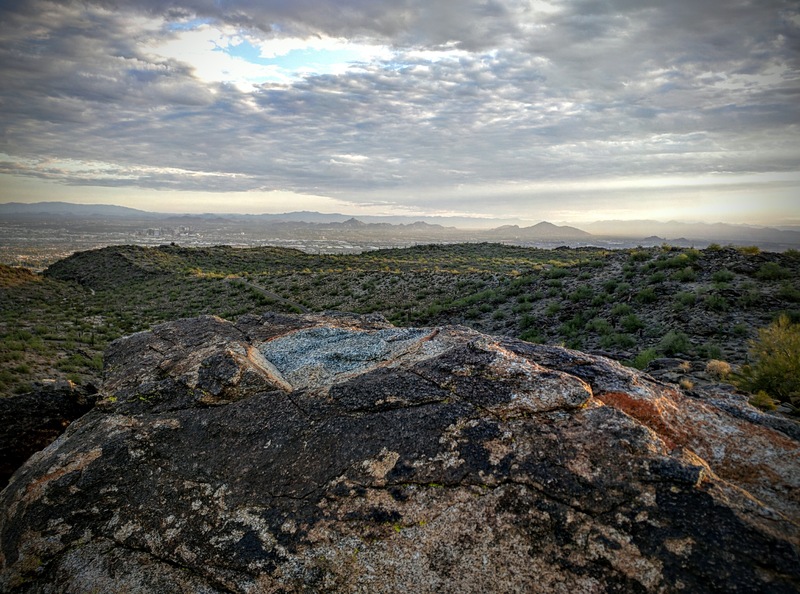 After about a mile you will start your climb, which continues at a moderate to difficult clip all the way to Dobbins Lookout. If you are feeling pretty exhausted here, the Lookout itself is a pretty neat old building built by the CCC during the Great Depression, and probably justifies a quick stop. Since I was here for a workout, I chose to keep my heart rate up and press on. After Dobbins Lookout, the trail flattens to an amazing extent. If you are any good at reading topo maps, you should see from the map above that though each of the three main buttes that make up the park are very steep sided, they all end in a wide, plateau-like ridge line. This is both good news and bad news; good in that you no longer have to keep ascending at such a strong clip, but bad in that there is no prominent peak to be conquered. An additional mile and a half of this slight uphill will bring you to the National Trail, where you will turn East. National is a truly amazing piece of trail building, which I’m sure will one day be covered here. The small section we are concerned with today first rises almost all the way to the very top of the range, before beginning a long descent to Telegraph Pass. If you feel tempted to hustle up to the peak, I recommend you resist. Because of the broadcast towers located here, the rangers haven’t taken very kindly to visitors since September 11th. Luckily though, the views of both the city and the next mountain range east (the Estrellas) make up for this. At Telegraph Pass you will find yourself meeting with many of the other main trails in the system. 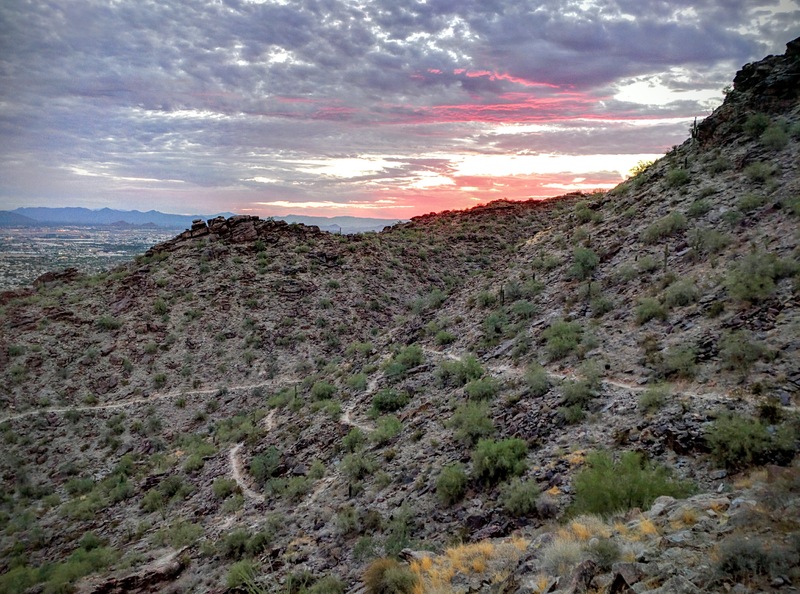 Because it is so close to the affluent neighborhoods of Ahwatukee, the trails around here get a lot of use, especially relative to the rest of the system. Because of this I usually try to hustle out of the area. To do so walk about 100 yards down the paved road until you reach a trail junction. Turning left here will keep you on the National Trail, quickly rising up past another CCC building to Hog Hill, while turning right will put you on the Kiwanias Trail. Kiwanis is truly a life saver during the AZ summer. Because it travels through a fairly deep canyon, the trail is partially shaded well into the morning (7-8 AM around this time of year). For this reason we turn right here. After a rapid 1.5 mile descent you will find yourself at the Kiwanis Trailhead. Cross this parking lot to reach the Los Lomitas Trail, which crosses the desert lowlands for about 1.25 miles before returning you to your car. After all this, you will have hiked 7.1 miles, climbed (and then descended) more than 1,100 vertical feet, all before breakfast without even leaving the city. This will make you happy. Then you will realize because you got so much done so quickly, and you still have to go to work. This will make you sad.